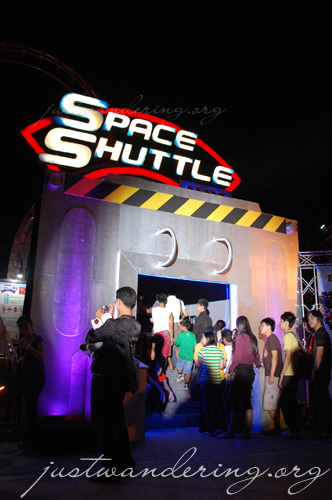 After months of closure, Enchanted Kingdom’s iconic ride, the Space Shuttle has been re-opened last Saturday to a huge crowd. There wasn’t any major changes in the track, except for a new paint job. The big change was the new cars that “give riders a greater feeling of space, as the body is more open, affording a more exciting experience.” The whole train was replaced with the latest available model, the Vekoma Mark 1212 train and coaches from Holland. It has a more comfortable ergonomic seating position and a state-of-the-art automated harness system. Frankly, I don’t know how the new cars are better because I was to chicken to ride it. I’ve ridden the Space Shuttle once several years ago, and that was enough. I can still remember how my knees were knocking against each other when I pried myself off my seat. Looking at the tracks, it looks easy peasy. 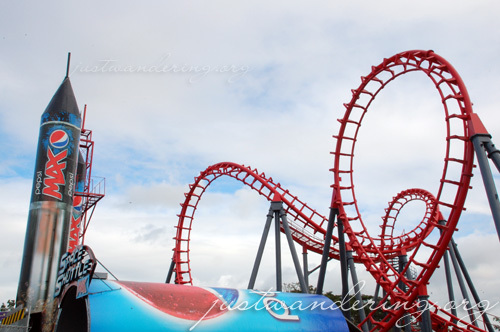 Three loops in quick succession doesn’t seem so bad, but having to ride through them backwards? I’ll pass. Lines quickly formed as soon as the Space Shuttle Max was formally launched. The theme park was packed that weekend and the lines on all the rides were long. Christmas is EK’s super peak period, where queuing times for a ride can be as long as 2 hours! The place looked lovely though. I especially love what they did to Brooklyn Place. The 1940’s style buildings were decked out with Christmas decors and fake snow, and under the twinkling of the fairy lights, it looked quite magical. To those planning to go to Enchanted Kingdom over the holidays, the park is open from 10am to 12 midnight until January 3, 2010. Fireworks display will be at 10pm instead of the usual 8pm. Ride all you can tickets are Php 500 per person. Riding backwards? That’s the BEST way to ride on roller coasters, m’dear. ‘Course, just make sure you don’t eat anything or you’ll probably end up spilling some of your lunch on some unlucky rider. N’yuk n’yuk n’yuk. 2 hours for a ride? Yeeesh. No super-passes? LOL. I don’t know if I can wait that long for a ride. It better be worth it though. Just wondering—how long does this Space Shuttle Max ride last? That’s crazy.. I love the death drop rides! Just dropping by to greet Merry Christmas! Have a grand celebration Nina! I also went to EK last December (Accenture x-mas party). Yep, the author is right. Almost 2 hours and just about 5-10 mins of fun. lol Too bad the SpaceShuttle is still under renovation that time. Nice post by the way.